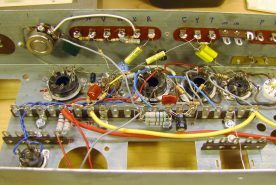 The mid-section of the rebuilt AO-29 amplifier. I’ve owned my Hammond organ for eight years now, and although it has been working quite well after replacing the tone generator capacitors and all the electrolytic capacitors in the amplifier, there were still some unresolved issues. Sometimes the speakers would emit a rumbling or rushing sound, regardless of whether anything was being played at the time. Such sounds in old equipment are often caused by carbon composition resistors as the particles in them loosen up over time. This effect also tends to increase their resistance, thus throwing off the calculations that went into the circuit’s design. Increase the high-end frequency response of the output stage of the amplifier so that external signals (my synthesizer) fed into the line input won’t sound dull. Add fuses to both the input and output sides of the power transformer to reduce the risk of fire. I didn’t know how long this rebuild would take before I had it working satisfactorily, and didn’t want to risk destroying an already mostly-working amplifier, so I purchased a second amplifier (without the tubes) to use as the basis for the rebuild. The amplifier I purchased was an AO-29-1H, which is designed for an organ with a field-coil speaker, as opposed the to AO-29-13 in my M-111 with permanent-magnet speakers. This meant that I would have to use the power and output transformers from my working amplifier, but that would be easy to reverse if I were unable to get the rebuilt amplifier working. I began by removing the two wiring boards holding many of the resistors and capacitors, cutting the leads close to the board to leave the wires as long as possible for possible re-use. 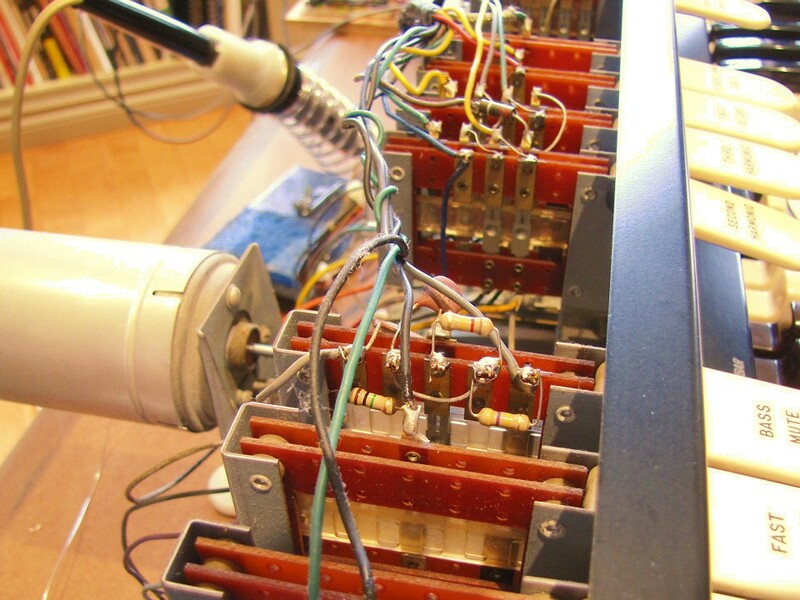 I then proceeded to unsolder all components and wires remaining in the chassis, except the filament heater wires and the wiring between the tubes and transformers in the percussion section. Although I was careful during the unsoldering process, using a solder sucking tool and fine picks and pliers to unwrap each wire or component lead, I did manage to break a solder terminal off two tube sockets. 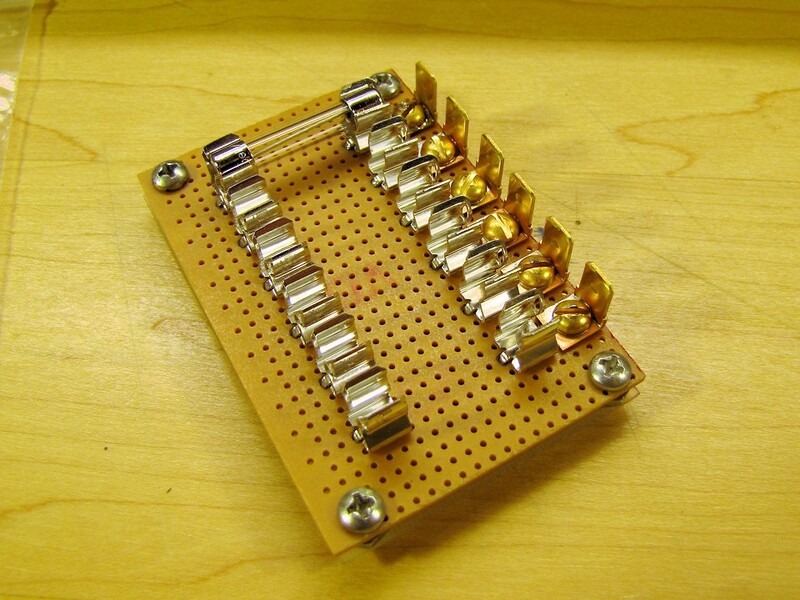 I ordered replacement sockets when I placed my order for the resistors and capacitors needed for the rebuild. 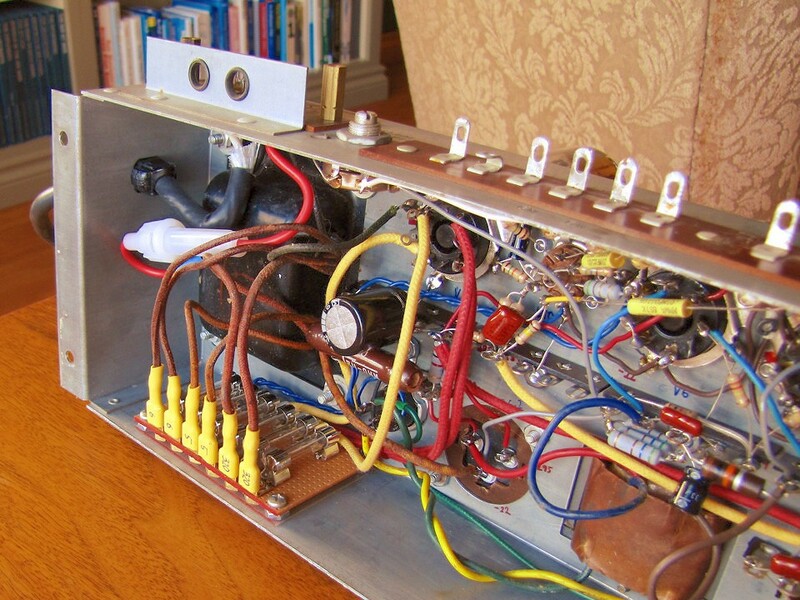 The completely stripped chassis, with two new tube sockets, and a new two-section capacitor. Instead of reusing the two eyelet boards that held many of the resistors and capacitors, I decided I wanted to use terminal strips instead. This has the advantage of keeping the layout fairly two-dimensional, making it easier to see and work on. 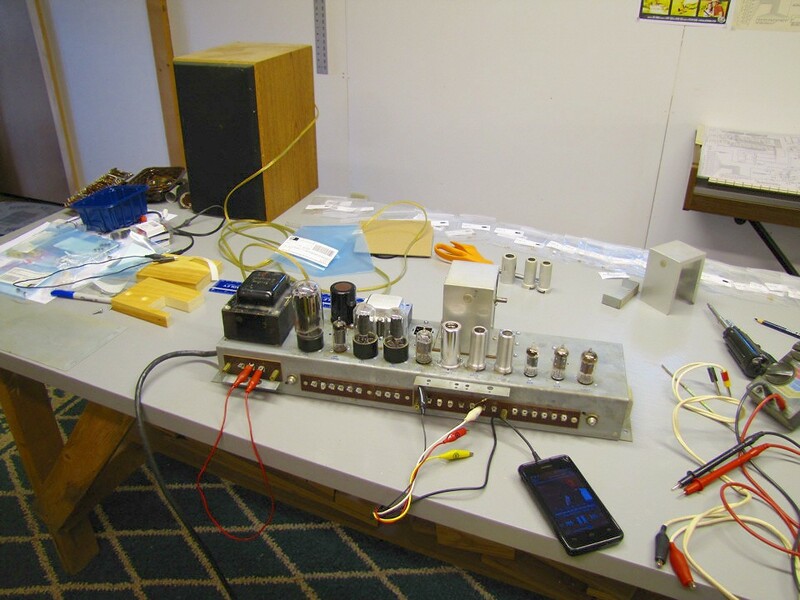 It would probably not have been feasible to build the amplifier this way originally, as many parts were much larger than they are today, so the space afforded by the extra dimension was needed to make it all fit. Having done a lot of point to point wiring in my teenage years, I knew there would be a lot of “soldering myself into a corner”, requiring parts to be unsoldered and moved around. This generally resulted in a mess, and a few damaged components and terminals along way. Instead I decided to apply the discipline required when making and using a printed circuit board, and designed the entire layout, at actual size, on paper first. To save time, I created a blank layout sheet with all the terminal strips and tube sockets in place using Photoshop, and then printed copies as needed. The completed wiring diagram, drawn full size. To aid in drawing consistently sized components, I made a template from thin plastic sheet, with cutouts for ½W, 1W, and 2W resistors, and various sizes of capacitors. The drawing itself was done in pencil, since mistakes and bad ideas were inevitable. I worked on the layout one sub-section of the amplifier at a time, working from an enlarged print-out of the schematic showing one sub-section per page. As I added each component and connection to the wiring diagram, I highlighted the corresponding parts of the schematic. Once the layout was completed, I scanned it and printed out another copy, and compared it carefully with the schematic, highlighting corresponding connections on both. This caught a few errors, which I corrected on my original working copy. Once I was happy with the layout, I drilled holes in the chassis for the terminal strips, and fastened them using 6-32 bolts, nuts, and lock washers. The terminal strips have been installed, and the chassis is ready for wiring. 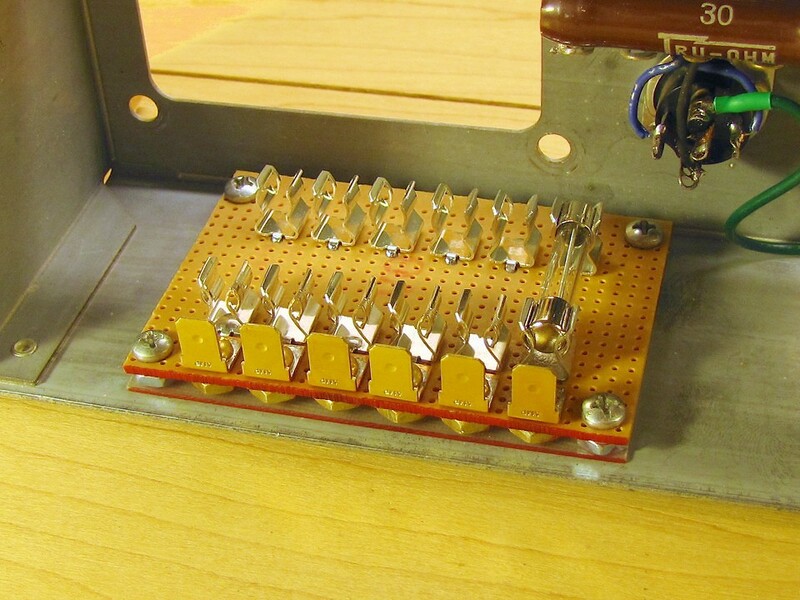 The vast majority of the resistors in the original amplifier were rated at ½W, although a handful were larger. Virtually all the capacitors were rated 400V or more. Working from both the schematic and the original amplifier, I determined the appropriate rating for each part. I ordered these parts from TubeDepot.com. I chose modern carbon-film resistors instead of new-old-stock carbon composition resistors, as the newer resistors would never change in value or become noisy. Some values of resistor were simply not available. For example, R101 is specified as a 180Ω 6W resistor. Instead, I used a parallel combination of two 560Ω and one 510Ω 2W resistors. 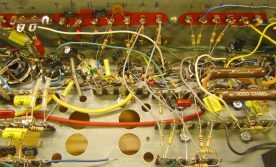 In other cases, I was able to improve upon Hammond’s choices, such as replacing the parallel combination of 22kΩ 1W resistors R14 and R15 with a single 11kΩ 2W resistor. With the chassis prepared, and all new resistors and capacitors received, it was time to set to work installing components. This was my first vacuum tube project, so it was a bit of a learning process. Just like my section-at-a-time design of the layout, I installed and soldered parts and wires one section at a time. 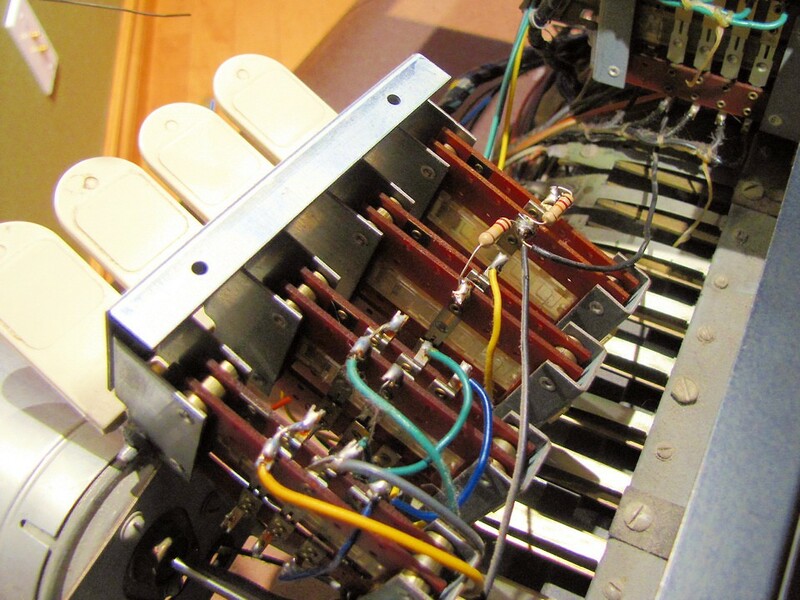 Components were installed by threading the leads through the appropriate terminals, wrapping them half way around for a secure mechanical connection. Once all the leads going to a terminal were in place, they were soldered. I used the same 45W iron I use for all my electronic projects, but with a much wider tip than usual. Work in progress. The pedal and output amplifiers are nearly complete. 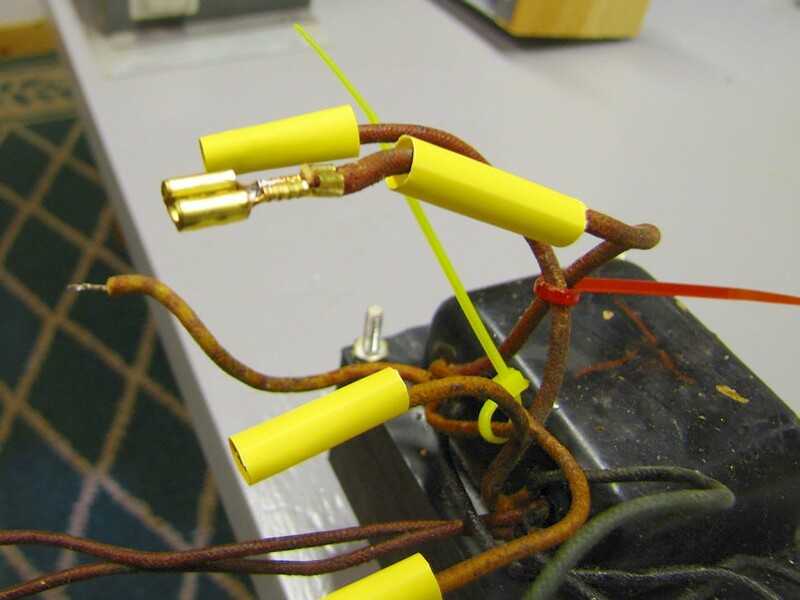 As each part was installed, it was marked with a highlighter on a copy of the wiring diagram. The astute reader may notice that a few parts (most notably, the large capacitors) are missing from the wiring diagram. These were installed towards the end of the construction, partially obscuring other parts, so they were left off the diagram for clarity. After all the components except for the power and output transformers were in place, I checked all the connections to ensure they were properly soldered. I then printed out a fresh copy of the sectioned schematic, and checked every component and connection in the amplifier directly against the schematic, bypassing the wiring diagram. This would detect both wiring errors, and any errors that were missed during the earlier check of the wiring diagram. The original design of the AO-29 by Hammond does not contain any safety fuses. In the event of certain failures, such as a shorted power supply capacitor or a plate-to-ground short in the rectifier tube, this could result in catastrophic damage, and possibly even a fire. After extensive reading of discussions about this issue on various on-line organ forums, as well as personal correspondence with Mike at TrekII.com (which sells a fuse retrofit kit for the Hammond AO-28), I designed a fusing scheme for the AO-29. There are a total of seven fuses. One is in the hot lead of the primary side of the transformer (I use a polarized plug to ensure that the hot and neutral leads are always connected correctly). There are also fuses in both leads of each of the three transformer secondaries: 5V, 6V, and 320V. The primary fuse is implemented using an in-line fuse holder, much like those used for automotive applications. The secondary fuses are all contained in a fuse block, built from scratch using PC-mount fuse clips on stripboard. Top view of the fuse block, showing PC-mount fuse clips and spade connectors. 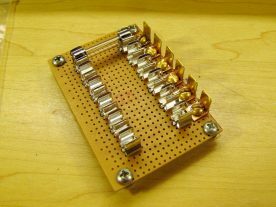 Bottom view of the fuse block. Soldered brass bolts and nuts secure the spade lugs. A piece of 1.6mm fibre glass board insulates the fuse holder from the chassis. The fuse holder is fastened to the chassis with four 6-32 bolts and nuts. Not shown in the last photo above are the wires from the fuse block to the amplifier circuitry. 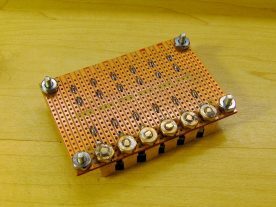 These were soldered to the board at the end closest to the top of the chassis (while the board was not installed) and then routed to the appropriate points in the circuit. With all the components and the fuse block in place and wired up, it was time to do a double transformer transplant. 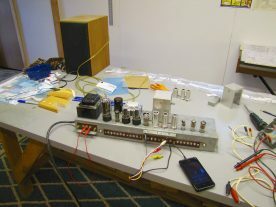 The power and output transformers were carefully removed from the existing amplifier, and installed and wired into the rebuilt one. The transformer secondary leads were terminated with heat shrink insulated female spade connectors. The transformer has been installed and connected to the fuse block. 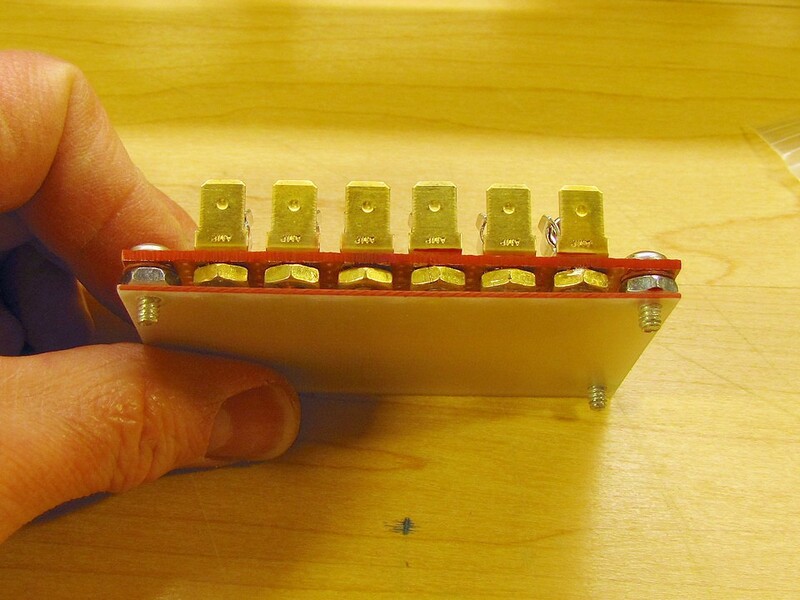 For ease of assembly, the secondary winding connections of the power transformer were terminated with female spade connectors, crimped and soldered. These were then insulated with heat shrinkable tubing, and connected to the fuse block after the transformer was bolted in place. Bottom view of the completed rebuilt AO-29 amplifier. Before reinstalling the amplifier in the organ, I performed one final inspection, and then tested it on the bench. I made up a cable with a 4-connector TRRS plug for my Android phone on one end, and alligator clips on the other. I connected the ground and left channel leads to the amplifier’s ground and A inputs respectively. 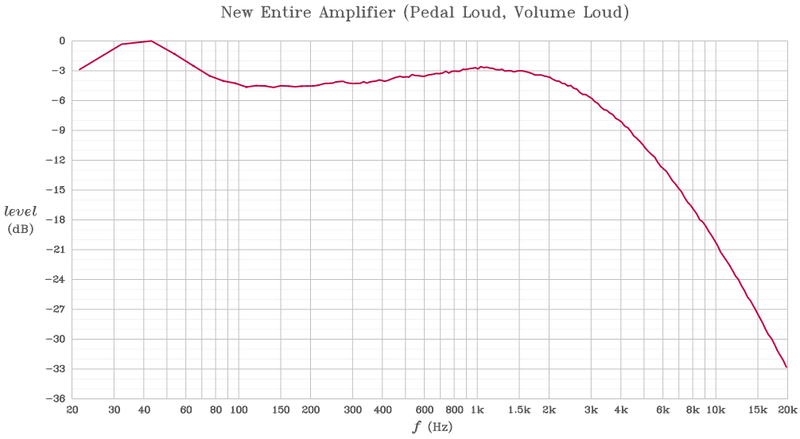 The output was connected to an 8Ω hi-fi speaker. I started some organ music playing on the phone, powered up the amplifier, and was pleased to hear it playing through the speaker. I then repeated the test using the B input. Testing of the pedal and percussion circuitry would have to wait until after installation. On the bench with a speaker connected to the output, and Klaus Wunderlich to the input. The finished amplifier, ready for reinstallation in the organ. After I was confident that everything was working correctly, I reinstalled the amplifier in the organ. I turned it on, waited for it to warm up, and was pleased to discover that everything was functioning! I did need to adjust the pedal cut-off and percussion potentiometers as described in the Hammond M-100 series service manual. Although the sound quality was greatly improved, with much less noise than before, there was still the occasional rumbling sound. I came to the conclusion that I should replace the remaining resistors in the organ, most of which are installed on the various switches. Most of the resistors on the switches were readily accessible. Some switch blocks had to be unmounted to access parts on the bottom. After all the resistors in the organ were replaced, the noisy gremlins were exorcised, and the organ sounded like new. Before beginning this entire project, I made several recordings of the amplifier. I injected pre-recorded white noise into the A input of the amplifier, and recorded the output at the speaker terminals via a line-out connector I added in the past. I then used Audacity to perform a spectrum analysis of the recorded data, exported this as text, and generated the graphs below using a Maple program. 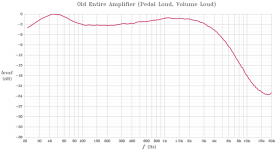 Frequency response of the original amplifier with pedal at full volume, and Volume Soft switch off. 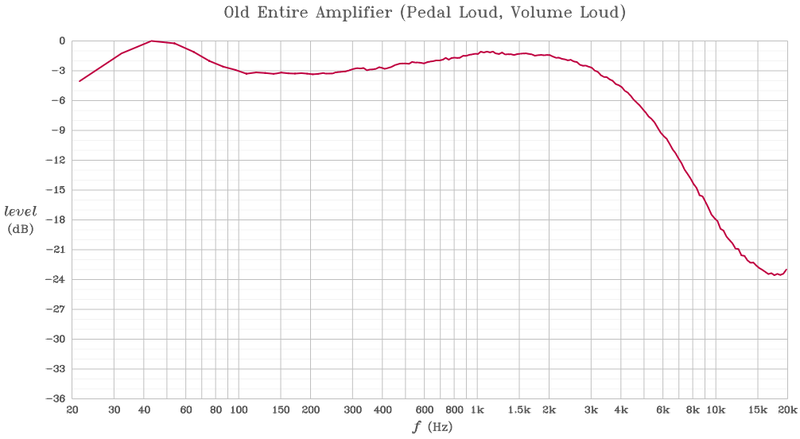 Frequency response of the rebuilt amplifier with pedal at full volume, and Volume Soft switch off. 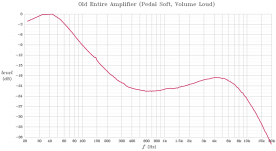 Frequency response of the original amplifier with pedal at full volume, and Volume Soft switch on. 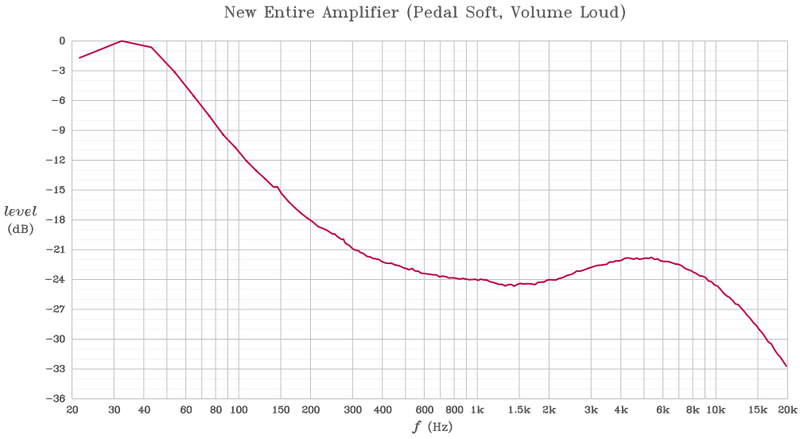 Frequency response of the rebuilt amplifier with pedal at full volume, and Volume Soft switch on. To compensate for the slightly non-flat frequency distribution of my white noise sample, I subtracted the spectrum of the input noise from each output recording, leaving only the effect of the amplifier. 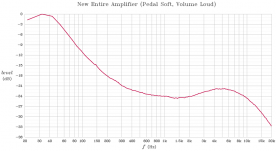 I also measured the response of various sub-sections of the amplifier. 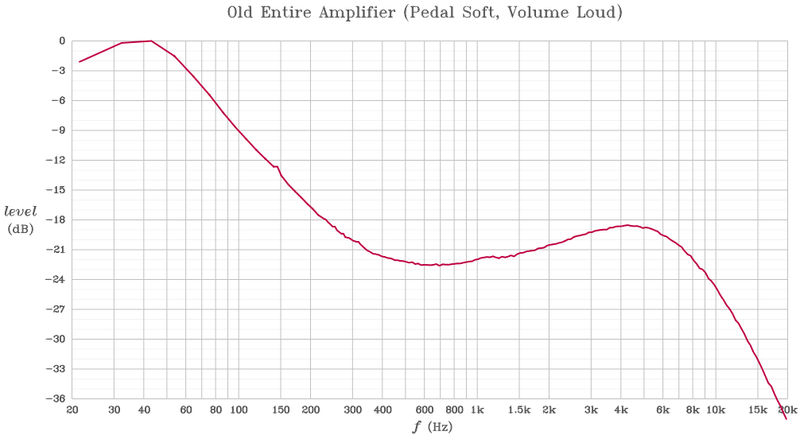 Rather than reproducing all those here, I refer the reader to this thread on The Organ Forum: Hammond AO-29 Frequency Response. Doing this rebuild has been on my to-do list for many years now, and I’ve been putting it off due to the work involved. It turned out to be a quite enjoyable project however, and although it was a lot of work, it didn’t feel like it at the time. 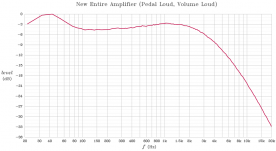 The end result of a much quieter amplifier was well worth the effort. I did my rebuild by completely following the permanent magnet version schematics. I just happen to have a field coil version available to do the build in (rather than rebuild my existing permanent magnet version in-place). I only kept the intermediate transformers from the field coil chassis to minimize the number of parts I had to remove from the working amplifier to make it easy to go back if needed. Makes total sense – I’m effectively removing my permanent magnet chassis (as it’s sufficiently in need of repair to warrant a complete teardown) and I’m going to drop in a field coil chassis to use while I take time to rebuild the main chassis. I’ve been tempted to take the power and speaker transformers out of the permanent magnet chassis and make the few mods required to use those in the field coil chassis, but instead I think I’m going to use Hammond’s TSB #27 and fit a lossy 700ohm 20W resistor in place of the field coil, leaving the rest of the field coil chassis stock. Next up – I’ve a hare-brained scheme to calculate the gain and impedance values for each stage and replicate with a DIY solid-state design. If the field-coil amp is only temporary until you get the PM one rebuilt, there’s probably not a lot of point modifying it beyond using the 700 Ohm resistor in place of the field coil. 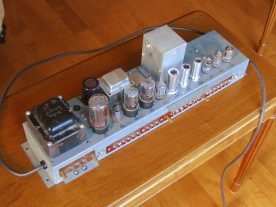 I had considered building a solid-state replacement too, but decided it was more trouble to design it than to just fix the old tube amp. Hi. What fuse values did you use? Hey Stefan, could you list what ratings of fuses you used in which line? I used 250mA on the 320V leads, 4A on the 5V, and 5A on the 6.3V if I remember correctly. The fuse on the primary side is 1.5A. Thank you for your reply, are they all slow blow? Well, I didn’t specifically select slow-blow fuses, but looking at the spec sheets for them, they all say, “Response Time: Slow”, so I guess they are. I have made a list of every component on the schematics for my M100, I am struggling to identify the required voltages for the capacitors, particularly the ceramic “disk” type, did you make any notes or have any tips? Sadly I can’t really work from the amplifier parts as it has been really messed with. Ceramic disk type capacitors are readily available in very high voltages, so if you go with anything 450V or higher, you’ll have no problems. I used mostly 600V caps since I had those on hand. Terrific job, and way beyond my current abilities, I’m afraid! I have a ’66 M111, love it, but I’m trying to repair it right now. Thanks for the inspiration, Stefan.